A few weeks ago you may still wonder about what 2014 MWC unveiled gadgets, especially unveiled new mobiles and tablets, will be brought to you after a little bit underwhelming CES in January. Now with the end of the expo season early this year, we believe you've experienced a show, the world's largest mobile show, filled with phones and tablets unveiled at 2014 MWC (Mobile World Congress). CES (Consumer Electronics Show): CES is an internationally renowned trade show for electronics and technology, annually held in January in the United States. As always, 2014 CES was held in Las Vegas from January 7-10. There were various kinds of new unveiled devices on CES 2014, including smart watches and smart washing machines. But disappointedly, mobiles were in short supply. MWC (Mobile World Congress): MWC is a combination of the world’s largest exhibition for the mobile industry. As a grand mobile trade show sponsored by Mobile World Congress, 2014 MWC took place from February 24–27 in Barcelona, Spain. Compared with CES, MWC focus more on mobile industry, and unveiled phones and tablets play big role at MWC 2014. That’s why Samsung unveiled gadgets, Sony new phones and tablets, unveiled mobiles of HTC and Nokia have been saved for MWC. CES and MWC are sure to be the places where you can get close to the release of new unveiled mobiles and tablets. So what are those unveiled phones and tablets to look out for at MWC 2014 as well as CES 2014? Let’s take a look back at a list of unveiled gadgets on 2014 MWC/CES. Samsung Galaxy S5 - Other than Apple iPhone 6, Samsung new gadgets 2014 may be what you’ve been expecting most for a long time. Rumor had it that Samsung Galaxy S5 would come with 2K display and metal body. While in fact, this Samsung unveiled phone at 2014 MWC does have loads of upgrades, but seems like that little of them are mobile phone essentials, like heart rate monitor. The unveiled Galaxy S5 has a slightly bigger screen (5.0 – 5.1 inches) with the same resolution as Galaxy S4. Even so, 1920x1080 full HD resolution display with 432 PPI is entirely enough for you to play HD movies on this 2014 MWC unveiled phone, not to mention its extended-life battery (2800mAh) and new powerful processor Snapdragon 801. What really comes as a disappointment to some is its plastic shell design as before. Sony Xperia Z2 - Sony Xperia Z2, unveiled at MWC 2014 last week in Barcelona, improves with a larger 5.2-inch HD 1080p screen with 424 PPI, a faster quad-core processor Snapdragon 801, and a 3,200mAh battery than its predecessor Sony Xperia Z1. Moreover, the 0.3mm thinner and 7g lighter design of this 2014 MWC unveiled mobile makes it more comfortable for you to hold and enjoy HD movies on the go, of course with its technology support of optimized color, contrast and sharpness. Besides, this new MWC unveiled phone features a 20.7MP rear-facing camera capable of shooting 4K video. And Sony Xperia Z2 is available at Carphone Warehouse now. 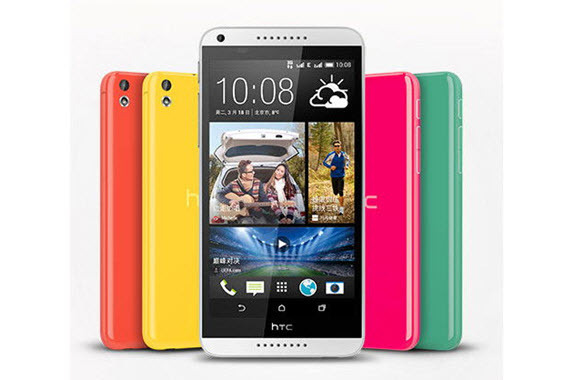 HTC Desire 816 - HTC Desire 816, one of the MWC 2014 unveiled gadgets, is a striking new phone especially for its bolder color shells. As to the specifications, there seems no essential upgrade. HTC Desire 816 was positioned as a mid-range phone this time at MWC 2014, only equipped with a display with 720p resolution compared with HTC One’s 1080p and a Snapdragon 400 processor. Not perfect, but still pretty good to play HD movies on this new unveiled phone. Maybe the good news is that HTC Desire 816 is slimmer and lighter than HTC One Max. Android-Based Nokia X - Three new phones were unveiled by Nokia at the MWC 2014 on February 24, Nokia X, Nokia X+, and Nokia XL, which will be launched in the Indian market. All the three MWC unveiled Nokia phones are powered by a 1GHz dual-core Snapdragon processor and unexpectedly run on Android instead of Windows, which means the new unveiled Nokia X is no longer a Windows Phone. Both Nokia X and X+ have a 4-inch display with resolution of 800x480p, while Nokia XL comes with a 5-inch screen and 768MB RAM. Moto X 2 - Is there a new Moto X mobile unveiled at 2014 MWC in Barcelona? No, only a new smartwatch was revealed. But Motorola gave a hint on Twitter that the new Moto X is around the corner. Moto X is a flagship Android Smartphone developed and manufactured by Motorola, released in August 2013. So what can we expect for its new flagship Moto X 2 in 2014? Is there any upgrade of screen, process or battery life lighting up our eyes? Just stay tuned for details. Samsung unveiled four tablets at CES 2014, including 12.2-inch Galaxy Note PRO and Tab PRO in 3 different dimensions - Galaxy Tab PRO 12.2-inch, Galaxy Tab PRO 10.1-inch and Galaxy Tab PRO 8.4-inch. The price for the four 2014 CES unveiled tablets has not been revealed. But we can take a close look at the specifications first. This new unveiled Samsung Galaxy Note PRO runs Android 4.4 KitKat, features a 12.2-inch LCD display with resolution 2560x1600 and is powered by 2.3GHz quad-core Snapdragon 800 for LTE variant. There are also Wi-Fi and 3G models with Exynos 5 Octa processor. Notably, the three other 2014 CES unveiled Samsung tablets come with identical specifications to the Galaxy Note PRO in OS, processor and resolution. The difference lies in RAM and battery. 12.2-inch Galaxy Note PRO and Galaxy Tab PRO come with 9500mAh battery and 3GB RAM, while 8220mAh and 4800mAh respectively for 10.1 inch and 8.4 inch. Before this CES 2014, I would recommend you Kindle Fire HDX (8.9 and 7) if you want t a great tablet for parental controls. Now you have other options since 2014 CES has unveiled some kid-safe tablets, like Dream Tab. This new unveiled tablet for kids at CES 2014, made by Hollywood studio DreamWorks, runs Android OS and offers you a kid-friendly App Zone, including some teaching programs, games, and e-books. You may get an 8-inch or 12-inch version for $100 right now in the US. 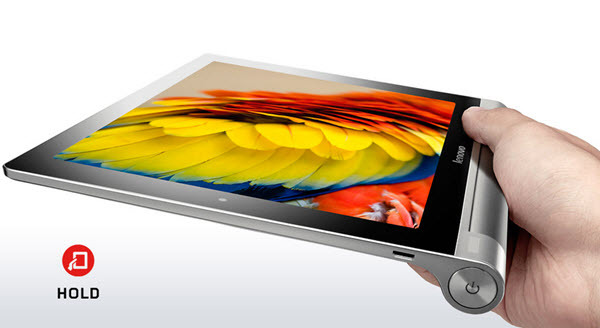 You may be surprised by this Lenovo unveiled tablet at 2014 MWC, which does have essential upgrades. The screen gets a spec bump from 1280x800 to a full HD IPS display (1920x1200) with 224 PPI. With 1.6GHz Snapdragon 400 processor, 2GB RAM and 9000mAh battery for 18 hours, this new unveiled tablet made its debut at 2014 MWC as a quite powerful gadget and attracts so many customers. Moreover, its kickstand design, which can stand the tablet up, provides you the most comfortable way to enjoy HD movies when you are out for travel. It may be a little behind some larger-screen tablets like iPad Air as for the resolution, but this 10.1-inch 2014 MWC Lenovo unveiled tablet wins at its lower price, £300 available from April. If you have already made up your mind to buy one or two CES/MWC 2014 new unveiled mobiles or tablets to play your HD movies on it, prepare in advance a powerful HD video converter. Does it really make sense for you? First your new 2014 CES/MWC unveiled phones or tablets may not support HD video formats, like MKV, AVCHD, M2TS, etc. You need to convert HD movies to the 2014 unveiled Samsung Galaxy S5, CES 2014 Galaxy Note Pro, Sony Xperia Z2 2014, or MWC 2014 Moto X 2. Although so many video converters (free or charged) are out there for you, few of them can meet your dual needs of fast video converting speed and high quality. So select carefully a practical HD video converter to convert your HD movies for those CES/MWC 2014 unveiled gadgets. 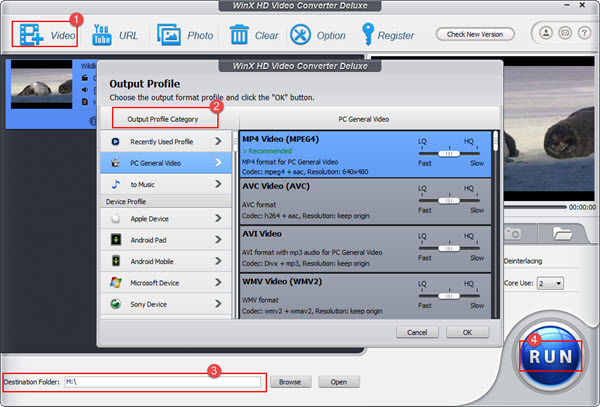 WinX HD Video Converter Deluxe, as its name suggest, is tailor-made for your HD video converting. Here are the steps of HD movies to unveiled phones tablets at CES/MWC 2014 converting. Download to have a try. 2. Load your HD movies by "+Video" or drag-and-drop. 4. Choose your desired output formats/devices. 5. Click button "RUN" to convert your HD movies to CES/MWC 2014 unveiled gadgets compatible formats. Play AVCHD on iPad - Convert AVCHD MTS to iPad and watch camera HD MTS video on iPad 4/Mini. Convert HD Video to iPhone 5 - Convert HD videos for iPhone 5, play HD video on iPhone 5.